The sombrero is a wide-brimmed hat commonly worn in Mexico. The wide brim shades the wearer from harsh sunlight, excellent for the Mexican desert climate. Sombreros come in many different patterns and designs, like the one in this free coloring worksheet. 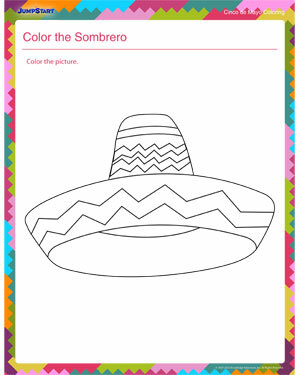 This Cinco de Mayo, teach your preschoolers about the usefulness of the sombrero with this printable coloring worksheet.